The other two quarterfinal ties will be scheduled on Friday afternoon, INA v TPE and JPN v DEN. It’s part two for both China against Germany and Korea vs Malaysia clashes. Will the outcome be repeated once again? An unfavourable draw for Germany to face such incredible team, and a tall order for German team to create new history. We’ll see whether China will rotate their players as some of them have not yet had a chance to show off their capability or, still field same roster with the opening match of group stage. A different case with Korea as they get their chance to redeem a previous surprising defeat to Malaysia in the group stages. Malaysia’s winning points are most likely to come from Men’s Singles, Men’s Doubles and Mixed Doubles. The line-up will be released tomorrow but predicted matches in singles may pit Son Wan Ho v Lee Chong Wei and Sung Ji Hyun v Tee Jing Yi. 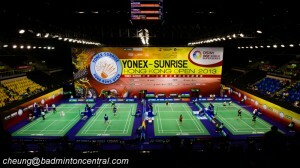 Korea most likely will change their doubles combinations to secure two points here to ensure a path to the semifinals. 2013 edition winner and runner-up, China and Korea marched on final four. CHN is indisputable badminton powerhouse to blank GER, 3-0. Little trouble was delivered by Fuchs/Kaesbauer against Fu/Zhang yesterday as first two ties. the Olympic Champion Zhang/Zhao and Lin Dan brought CHN lead 2-0 through straightforward victory. Korea redeemed their opening match losing, 3-1 and ended Malaysia journey in this event. The always dependable Lee Chong Wei stole 1 point to dispose Son Wan Ho in convincing style. Vivian Hoo/Woon KW kept MAS hope alive as this duo grabbed first game 23-21 before succumbed to Chang YN/Jung KE in next two games, 21-16 / 21-11. The two remaining quarterfinal ties will be played this afternoon and intriguing matches are highly expected. On paper scenario, JPN and former champion INA are favour to meet KOR and CHN respectively tomorrow. The first match is crucial for both team and will determine their chance to step up into last four as TPE has advantage to scoop two points in singles category while INA is the favourite to seal last two matches, WD and XD. The final scoreline should be 3-2 either for INA or TPE team. Denmark line-up is pretty odd, Kolding will be paired with Astrup instead of his regular partner Mads Conrad Petersen and Kjaersfeldt will play two discipline, Women Singles and Women Doubles. Danish squad has opportunity to grab points through Mixed Doubles, Men’s Singles, Men’s Doubles. Their Ladies Singles and Ladies Doubles are no match against the Japanese players. If the scoreline stands at 2-2 then Japan absolutely will clinch the last match. Will Denmark could pull upset over one of the frontrunners Japan?